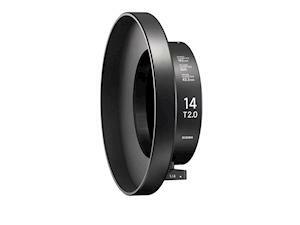 Ronkonkoma, NY – April 5, 2018 – The Sigma Corporation today announced the newest accessory for its Cine High Speed 14mm T2 FF Prime Lens – the Clamp-On Ring 162mm COR-11, which extends the front diameter of the lens to 162mm. When attached to a wide-angle matte box compatible with 6.6" x 6.6" square type filters such as the ARRI LMB-6 (2-stage), the setup allows cinematographers to film on full-frame cameras without undesired vignetting. The Sigma COR-11 is also compatible with SF Ex-tender SF-E1 (optional) and other third-party accessories. Sigma continues to expand its Cine offering by providing solutions to the increasing demand for cine lenses compatible with digital cinema cameras with large format sensors. The Clamp-On Ring 162mm COR-11, along with Sigma Cine lens lines – High Speed S35 Zoom, FF Zoom and FF High Speed Prime, will be on display at the 2018 NAB Show in Las Vegas from April 9th through April 12th in booth C10308. Pricing and availability of Sigma COR-11 will be announced at a later date. In 2012, the company introduced the Sigma Global Vision with three distinct lens lines: Art, Contempo-rary and Sport. Designed for industry camera mount systems including Canon, Nikon, Olympus, Pen-tax, Sony and Sigma, each lens is handcrafted and tested in Japan to ensure a high-performance, premium product that is purpose-built to last.